BROOKYLN, NY / ACCESSWIRE / October 8, 2016 / Dmitry Druzhinsky, real estate investor and developer, has been revolutionizing New York's residential and recreational infrastructure for over fifteen years. His latest property, Brooklyn's MatchPoint NYC, has risen as the city's premier sports, health and fitness destination for amateur and professional athletes of all ages. The 120,000 sq. ft. luxury complex features comprehensive, state of the art facilities and a friendly staff of certified instructors, personal trainers, and nutrition consultants to ensure that members achieve desired results in an effective, efficient, and safe manner. Dmitry Druzhinsky's passion for real estate began in 2000, when he spearheaded the development of his own home. He has since been responsible for the construction and sale of over one hundred properties. As co-founder of MatchPoint NYC, his prior experience in the acquisition and repositioning of land was instrumental to the success of the grand $20 million project. The arduous negotiation process with New York City's Board of Standards and Appeals for permission to build on the highly sought after three acre lot only came to a conclusion after the businessman worked with the city to "de-map" a street that, although unused for the last century, bisected one of the parcels where the structure was to be erected. Upon its completion, the center became the largest recreational complex of its kind in Brooklyn, and the second largest in all of New York. MatchPoint NYC's mission to improve the health, fitness and overall well being of its members is evident in every facet of the multi-million dollar facility. The spacious, 12,000 sq. ft. gym invites participants to reinvent themselves with the most advanced exercise equipment available and complimentary personal trainers, while a steam sauna and spa offer relaxation and rejuvenation after a taxing workout. For parents who wish to watch their children during lessons or for those taking a break between training sessions, a full service restaurant equipped with couches, HDTV's, and a juice bar overlooking the nine cutting edge, indoor tennis courts, six mini courts designated for youth, and a world class junior Olympic pool. In addition, over one hundred classes are held each week in three group fitness studios and a rhythmic gymnastics center, including Pilates, yoga, boot camp, and Sambo Academy. From professional athletes to children entering a sport for the first time, MatchPoint provides the means to learn, excel, and succeed. 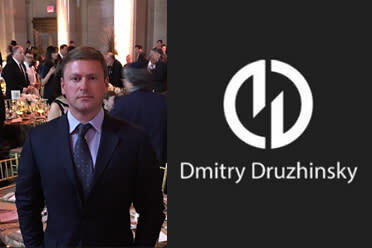 Dmitry Druzhinsky is a South Brooklyn real estate investor, developer, and entrepreneur. Best known as co-founder of the renowned MatchPoint NYC, Druzhinsky is also an avid philanthropist with strong ties to many of the region's charities and community initiatives. In collaboration with the R Baby Foundation, America's first and only nonprofit organization with the mission of saving infants' lives by improving pediatric care, he has helped raise funds for hospital programs, telemedicine with pediatric experts, mobile simulation training, and symposiums.